Just a quick note of thanks to those who voted for me, to those who clicked more than 1,000 times just for me to land on the top 10, A HEARTFELT THANKS! To fans and millions of readers (naks, parang meron? hahaha). To all the judges, thank you so much! Galing ng taste n’yo, di kayo ngkamali! 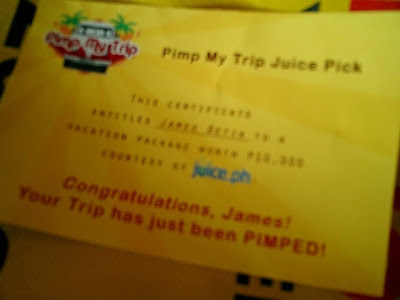 I just won a PhP10,000 worth of vacation package for my entry “Good-Bye Passport, Farewell Bangkok” to Pimp My Trip Worst Vacation Experience. Now, as promised, I have to tell the rest of the story… Hmmmm, I wish there’s another blog contest on your best vacation ever to motivate me as I’m a slacker on writing stories. Maria Christina Schoolcraft for her “Amazing Race” entry. She won PhP20,000 travel package. Thanks again Juice! Juice squeezes all the best out of all these resources to give you what is absolutely the most effective, intelligent, comprehensive—and fun!—Philippine lifestyle guide. (And we do mean ‘absolutely’—we didn’t win the 11th Philippine Webby awards in our category for nothing!) We’ve got fresh, candid user reviews, ratings, and in-depth articles on the many amazing things you can do, see, and enjoy across the archipelago. What’s more, since Juice is powered by eyp.ph—the Philippines’ premiere directory listings expert—we provide not just event schedules and movie screening times, but complete contact information, locator maps, hours of operation, and many more details on over 200,000 lifestyle options, venues, and establishments across the country. Simply put, if you want fun, you want Juice—and Juice wants you! You can make our community even better by rating movies, events, and establishments; commenting on establishments, articles, and reviews; and even uploading photos or videos of yourself visiting one of our featured venues. So what are you waiting for? Drink in all the goodness we’ve got to offer—and make Juice your main squeeze! Now, where will I go with that vacation package? Sinong gusto sumama? This entry was posted in Uncategorized and tagged Blog Contest. Bookmark the permalink.